During relocation, you need to be sure that your belongings are kept safe and secure until you are ready for them to arrive at their final destination. At Booth Movers, we offer short and long-term New Jersey storage services to fit any budget. Whether you are a commercial customer in need of warehousing solutions or are in the middle of completing a residential move, our experienced New Jersey storage company is the first choice for all of your storage needs! As the first choice in New Jersey storage services, Booth Movers operates a state-of-the-art storage facility conveniently located just minutes away from the New Jersey turnpike and Manhattan. Our fully secured 32,000-square-foot warehouse features 24-hour video surveillance and a robust alarm system to ensure the security of your valuable belongings. Our New Jersey storage company offers a variety of solutions that can be customized to fit the needs of both residential and commercial customers. 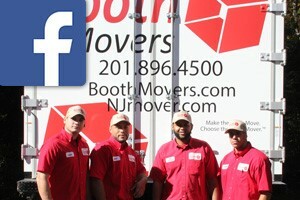 Booth Movers is the premier choice for New Jersey storage throughout the Bergen County area. Our New Jersey storage company also holds an A+ rating with the BBB, further demonstrating our commitment to quality service. Household Storage – If you need more time while completing your move, you can trust our New Jersey residential storage company to securely store your belongings. Commercial Storage – Booth Movers is experienced in all areas of commercial relocation and storage, and our secure storage facility will exceed all expectations! Warehousing and Distribution – If you’re looking for a professional New Jersey storage company to handle your business’s warehousing and distribution, give Booth Movers a call today! For the highest-quality storage solutions in New Jersey, there is no better choice than Booth Movers! To learn more about our customizable storage solutions for your home or business, give us a call or fill out our online form today!